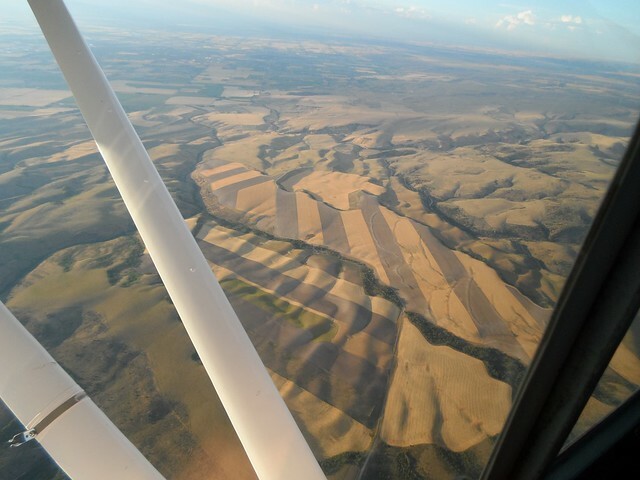 On Sunday morning we departed Nampa, ID for Independence, OR. 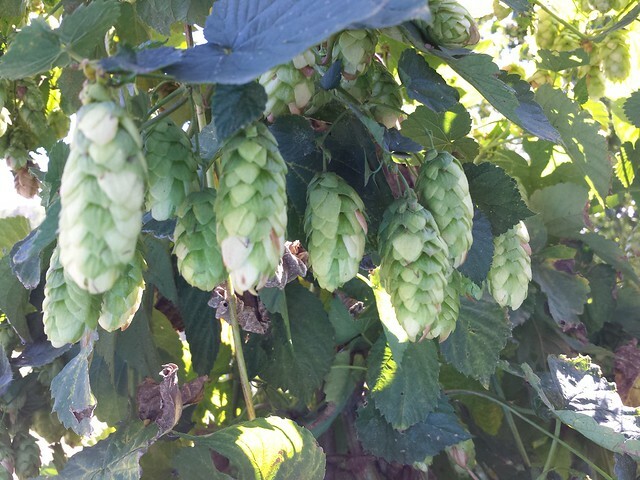 Rogue Brewery’s hop farm is there and they were having their annual hop harvest festival. 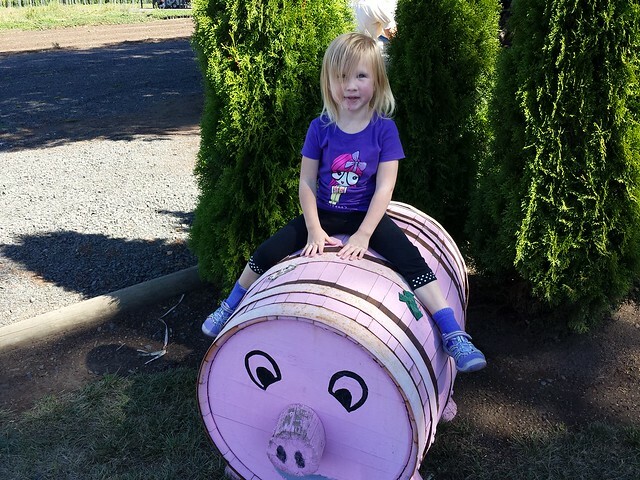 Also one of Ava’s good friends moved to that area earlier in the Summer so we made plans so they could spend the day together as well on the farm. We made one fuel/break stop at Prineville, OR. 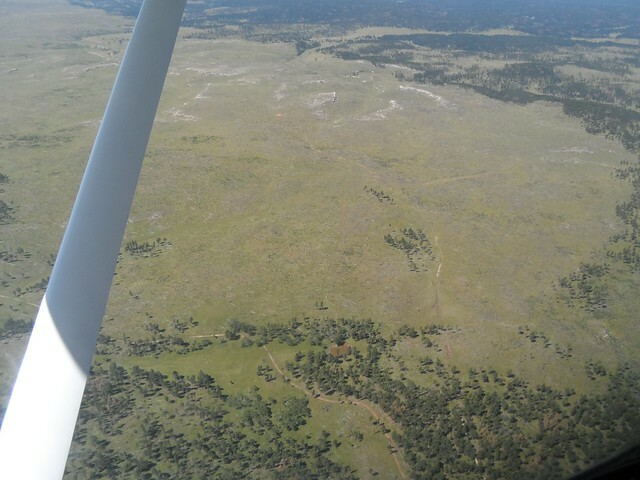 Prineville is in the Bend/Redmond area just east of the Cascades. 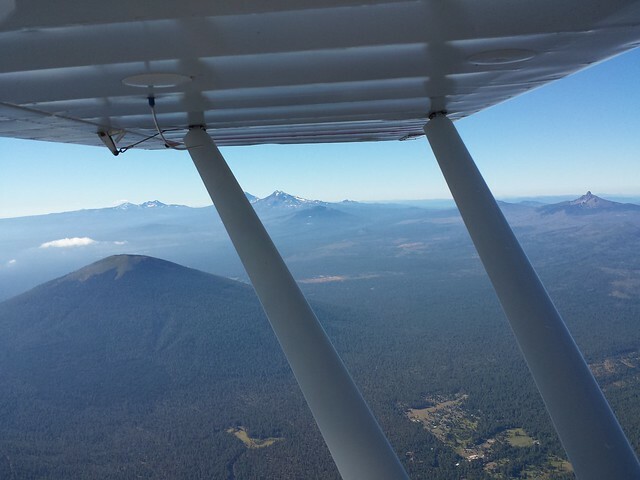 Flying through the Cascades was really pretty. This is about 15 miles north of the Three Sisters. 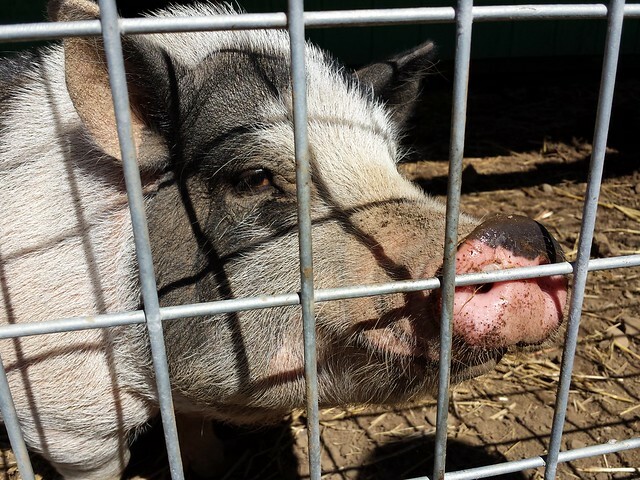 We grabbed the courtesy car from Nutsch Aviation in Independence and headed to the farm. 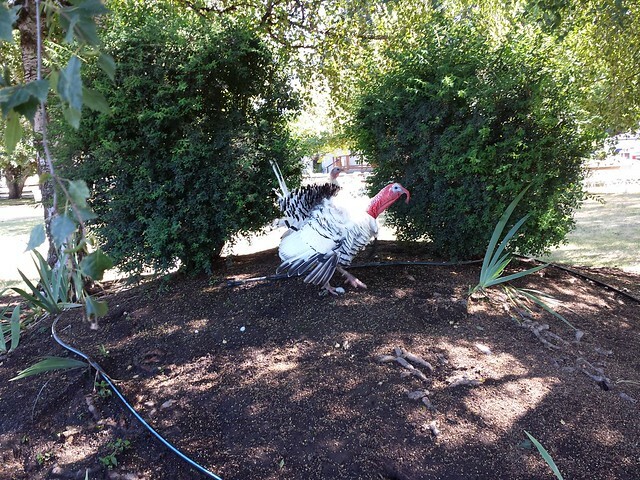 We were greeted by Tom the turkey that lives on the farm with two hens that he keeps a close watch over. 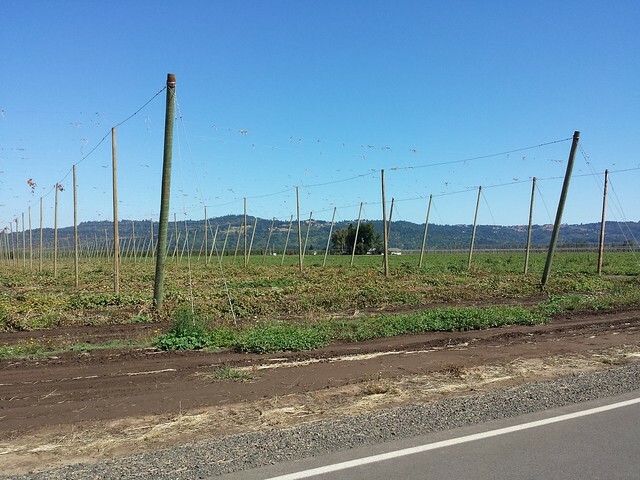 Most of the hops were actually harvested a few weeks earlier and only the trellises remain. 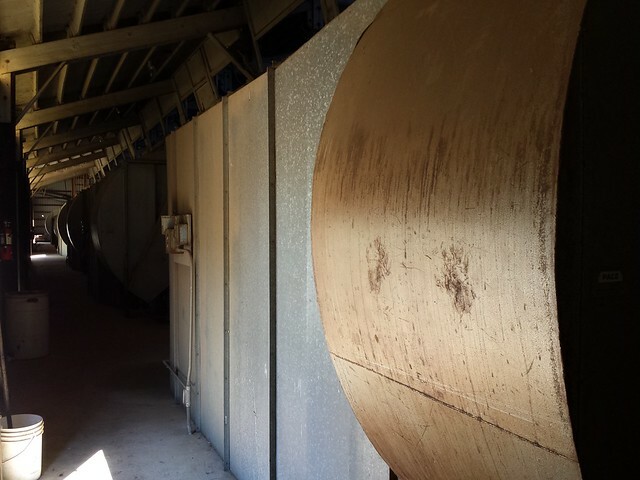 There are two pigs that live on the farm, Voo and Doo. Not sure which one is which, but this one was really friendly. 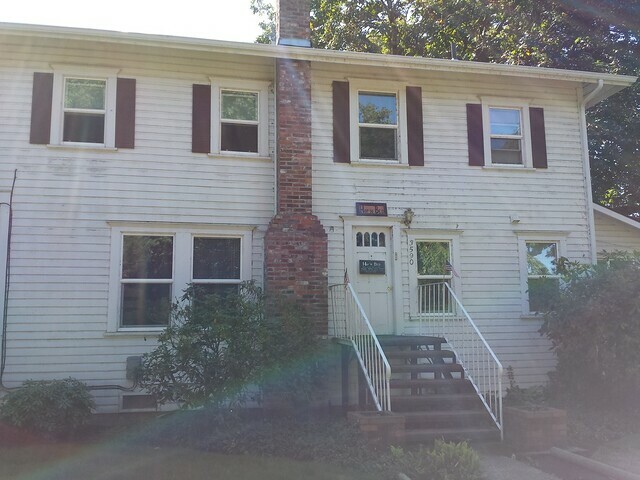 This is the “Hop ‘n Bed”, a 100 year old farm house that can be rented as a bed and breakfast. Sleeps 12. 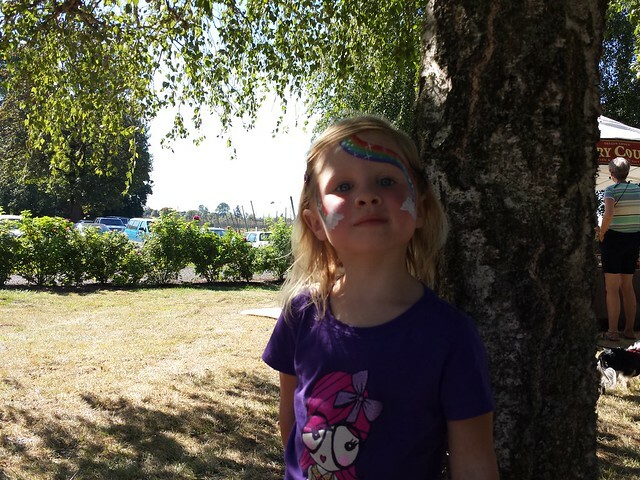 All the girls got their face painted, which they loved. And finally headed back the following morning. 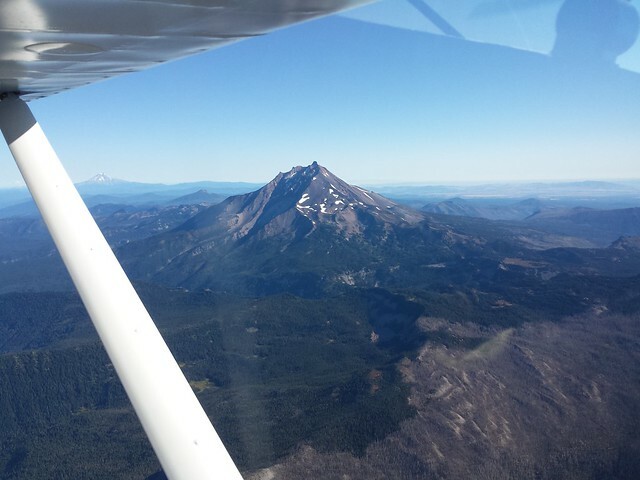 Took a slight detour to get a good view of Mt. Jefferson. 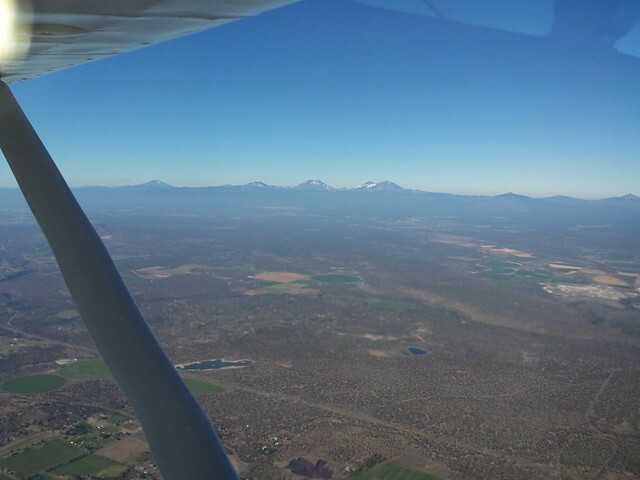 Mt Hood is in the background. 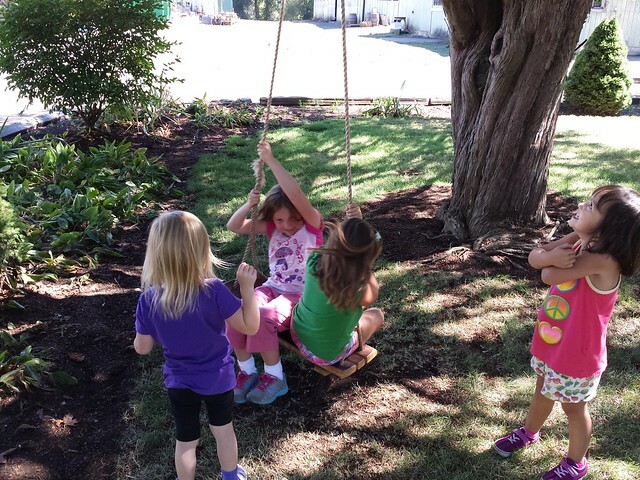 This entry was posted in Trips and Sight Seeing on September 10, 2013 by scott. 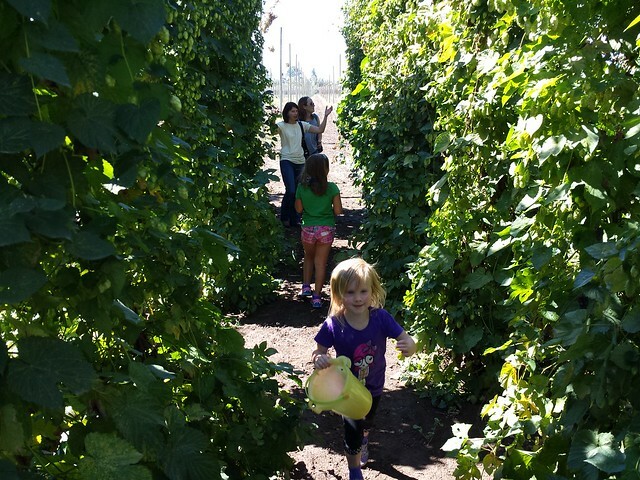 Yesterday we returned from our journey from Nampa to Minnesota and back. We took a more southern route there and came back on the northern route. If you are interested in seeing the details you can explore the route here. 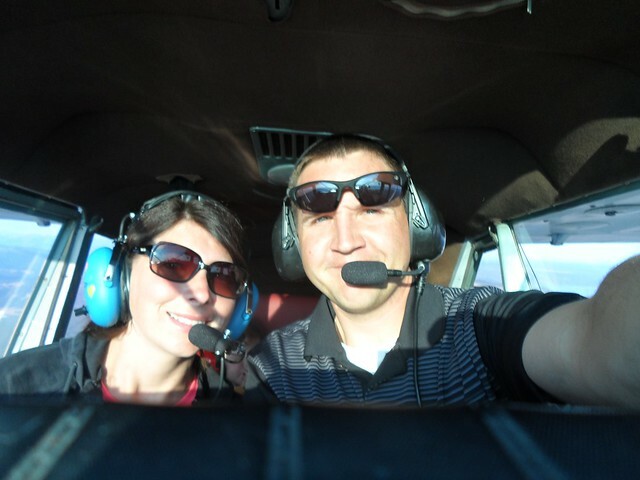 Jenn and I were worried about how well the kids would do traveling such a long ways in the plane, but once again they impressed us with their adaptability. Overall we had a wonderfull time. It was so cool seeing a big chunk of the country from a few thousand feet, and there are enough variables with weather, fuel stops, bathroom breaks, etc. to really make it an adventure. It was fun to contemplate how many times this little plane may have crossed the Rockies in its 57 years, or the stories it could tell. 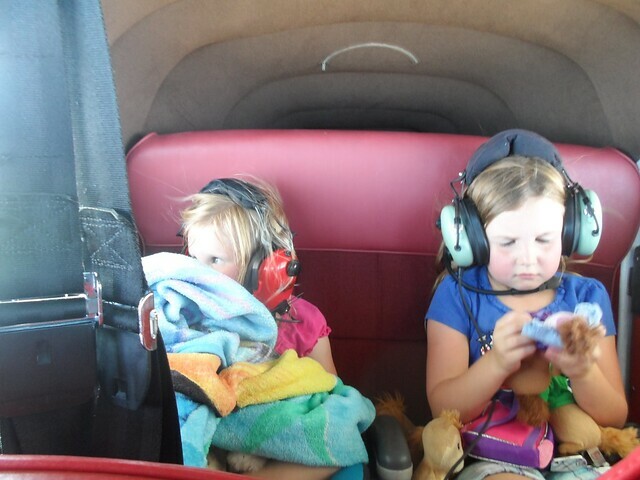 In our ancient little plane we could have been time travelers from the 1950’s… minus that iPad on the yoke. 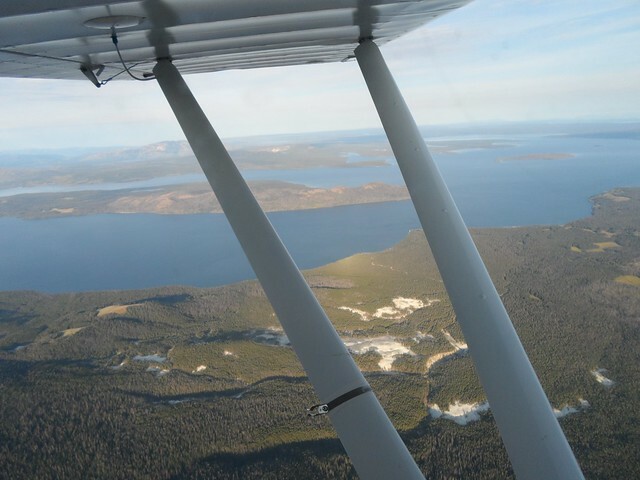 Most of the time we stuck fairly close to our time schedule and planned routes but at times we flew by the seat of our pants, re-routing in the air due to adverse weather or other factors. And the experienced gained was really valuable… not so much in the realm of physically flying, but a deeper understanding of the art of aeronautical decision making. 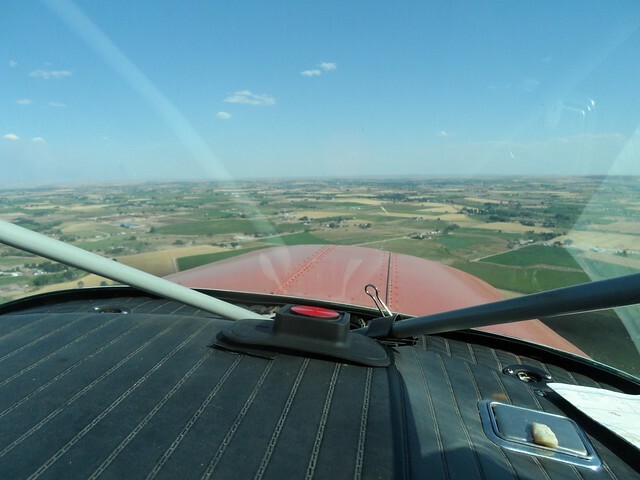 Flying is easy, making decisions and balacing risk is hard. 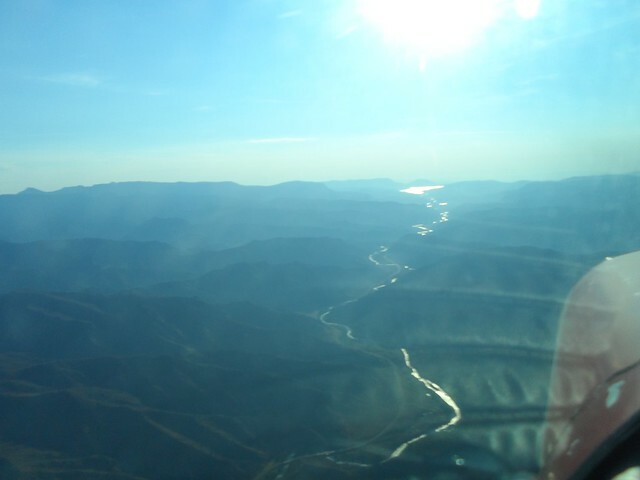 When flying across the country, some days are brilliantly clear and the air is as smooth as glass. 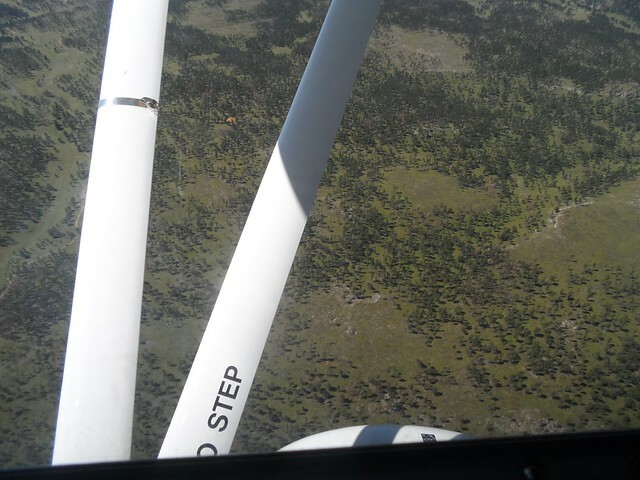 Other days we are thinking twice about flying after hearing a weather forecast, making mental notes of Plan B, Plan C, and Plan D and seeing how many miles we can put on before that convective activity picks up and starts producing thunderstorms. We quickly learned that although weather is extremely important, if you only fly on days that are forecast to be “perfect” you will never reach your destination as you will be sitting on the ground. We get to the airport around 4:30PM, planning to depart around 5. 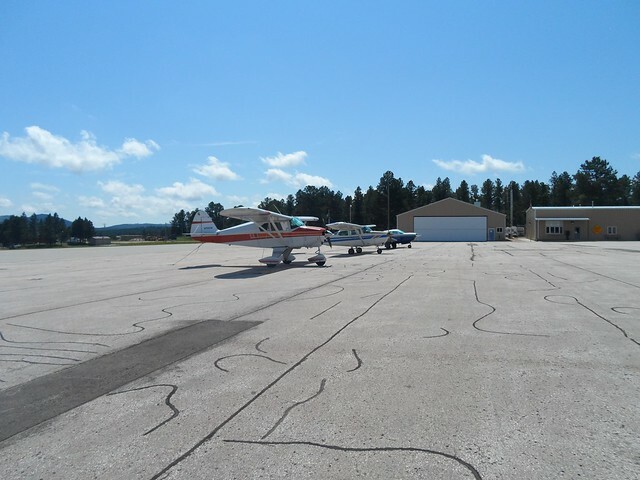 The plane is pulled out of the hangar, booster seats are put in the back seat, bags are jammed in the baggage compartment, and we barrel down the runway into the hot sky. We know it will be a bumpy ride for a while from all the cumulus clouds about. 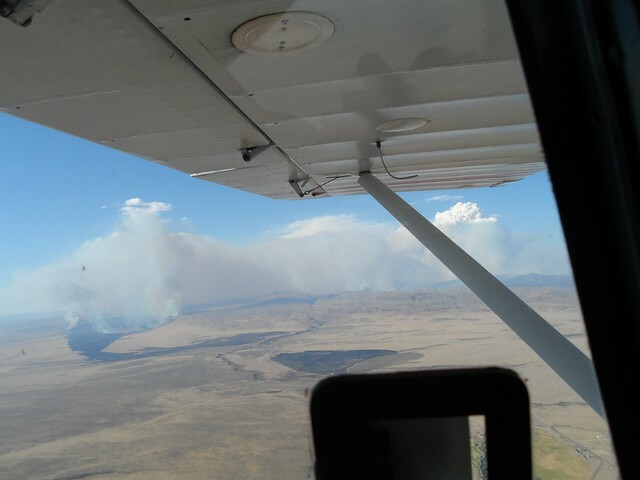 As we pass by Boise, we get a good view on the forest fire status. A good portion of the southwestern part of the state is on fire and we get a front row seat to numerous pyrocumulous “fire clouds”. So much heat was being generated it created these powerful updrafts that produced clouds extending to 40,000+ feet! Wow. We point the nose a bit further south to give them a wide berth. 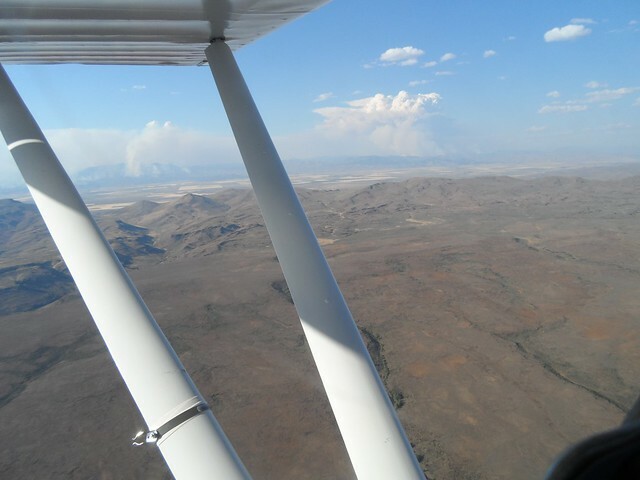 We flew by lots of little fires for 80 miles, listening to all the chatter on the radio from the fire crews making trip after trip dropping retardent. All the while we are riding a rollercoaster of thermals typical of flying in the late afternoon. The kids are suprisingly tollerant of the light turbublence and don’t really seem to notice. We slow down in the updrafts to gain as much “free” altitude as we can, and speed up in the downdrafts to get out of them quicker. 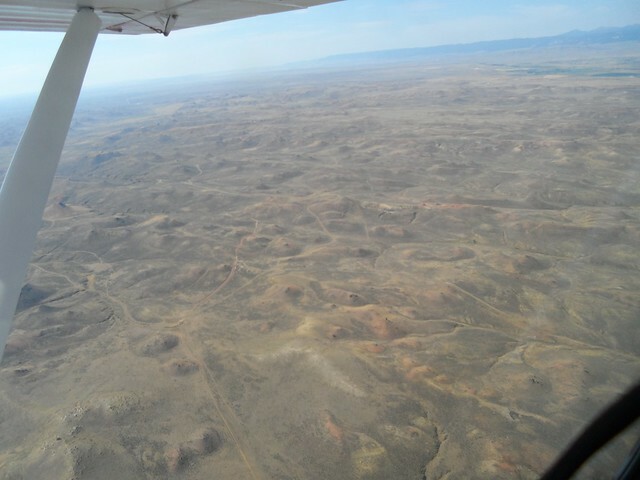 Not much to see out the window, just miles of desert that is southern Idaho. As we get closer to sunset the air smooths out, and the scenery improves with every mile we get closer to Driggs. 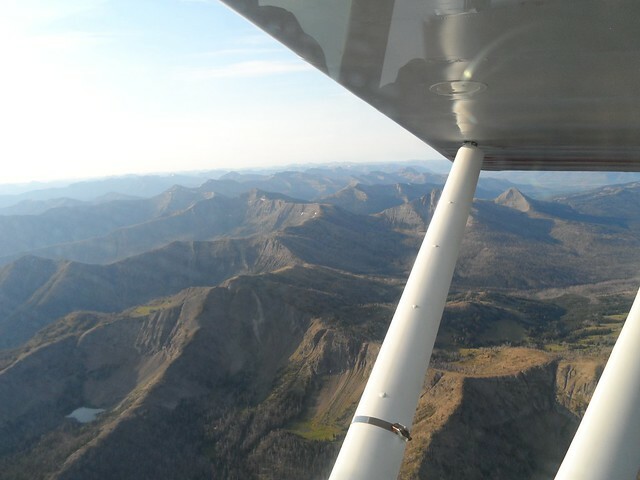 We left when we did to get to Driggs just before sunset, about a 2.5 hour flight. 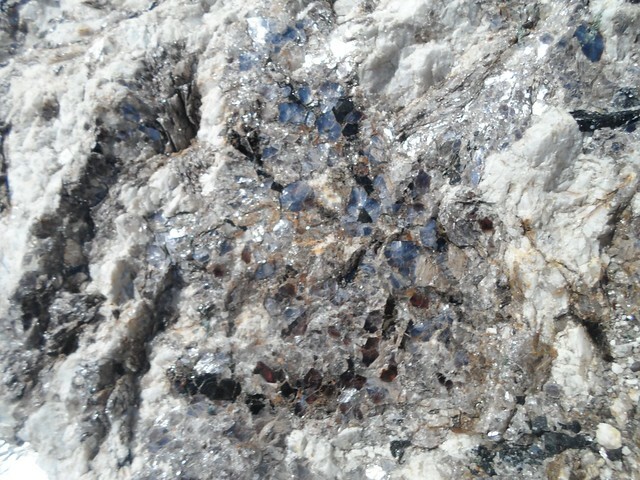 I found this contrast in the field below to be cool. 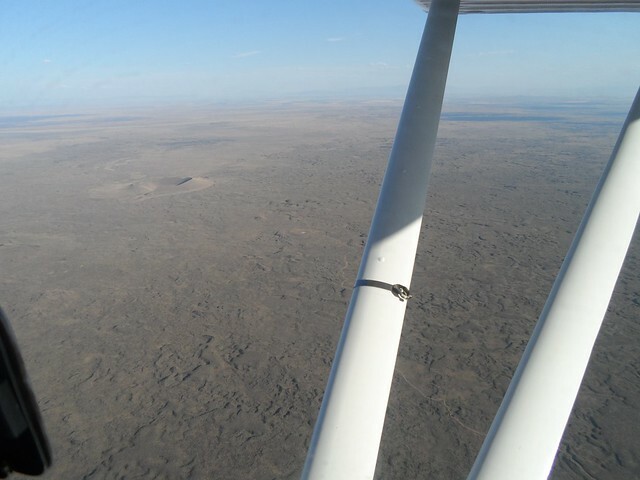 Finally we see Driggs off in the distance and start losing some altitude in preparation to land. We make our landing, and I try to make it a decent one because all the people eating outside at the airport restaurant are watching us. We taxi to the ramp and find a parking spot. While I am getting the plane tied down a amphibious seaplane is starting up and the girls watch it take off into the sunset. We jump in to the courtesy car and drive in to town to our hotel. 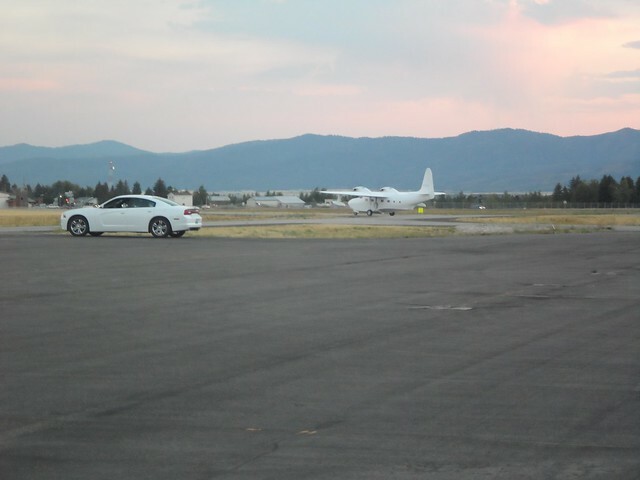 Yep, we have the smallest plane on the ramp. We woke up early today. 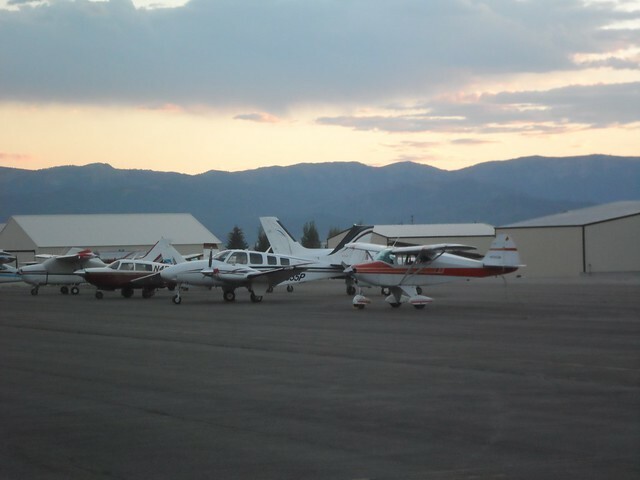 Our little Tri-Pacer is not the most powerful plane in the world, and we want to climb out in the cool morning air before things heat up. Driggs sits at 6,230 feet above sea level, so we know climb performance will be anemic with the full load of people, bags, and fuel. 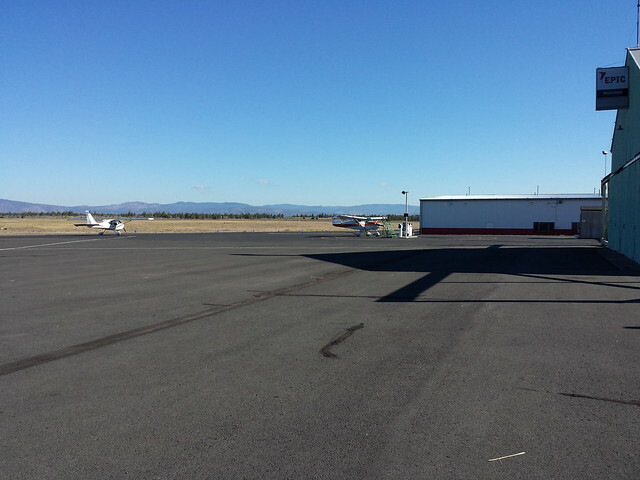 The ramp attendant fills up our wings with avgas and we taxi over to the runway. I do a quick run-up to check the redundant magnetos and carb heat. Uh-oh. When running on the right magneto the engine is running rough… not good. Doh!… I look at the fuel mixture knob and realise I did not lean the fuel mixture for taxiing. In this thin air I was giving the engine too much fuel and it fouled a spark plug. I lean the mixture way out and run the engine at full throttle for a minute and eventually the plug clears and we are good to go. 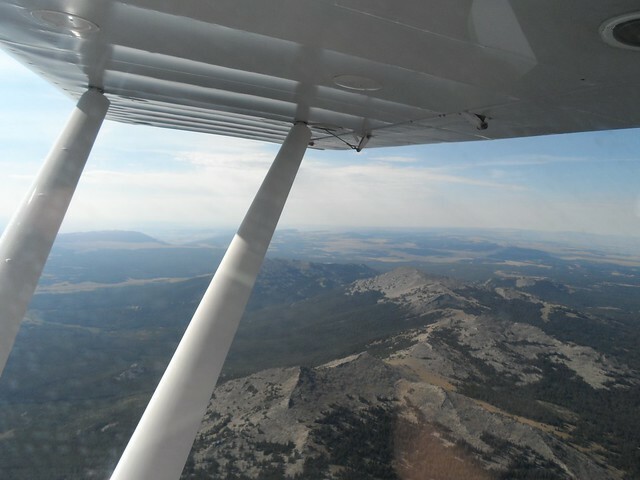 We take off and I pitch the airplane for a cruise climb, about 90mph, and we slowly gain altitude while enjoying the spectacular view of West Yellowstone. We need to climb to at least 10,500 feet before I am comfortable entering Sylvan Pass and weave our way through the Rockies. 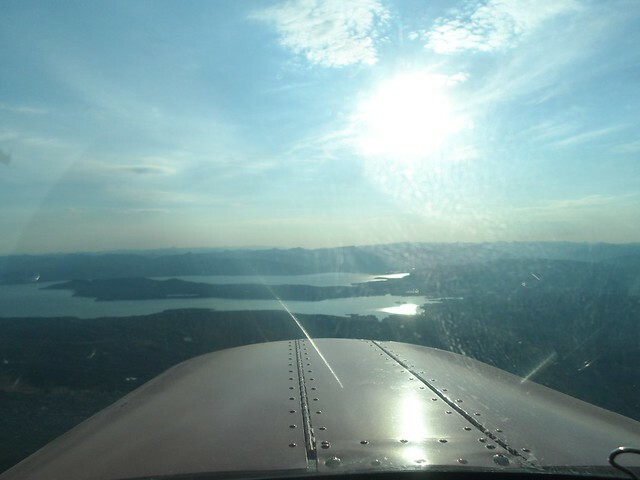 When we reach Yellowstone Lake we have been climbing for 25 minutes and have all the altitude we need. 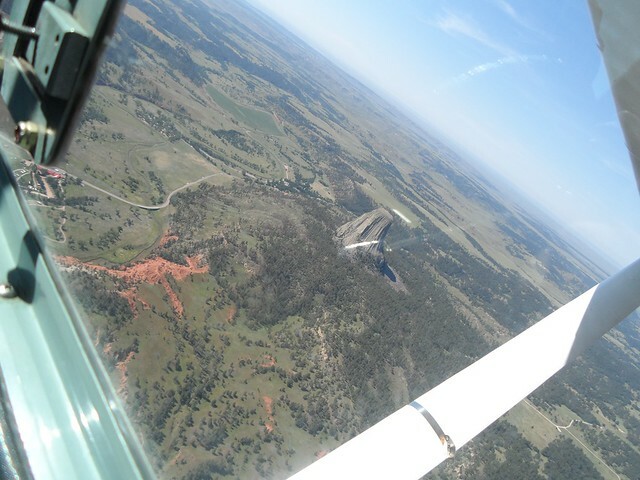 But, the plane is still climbing OK so I just keep climbing for a little insurance. 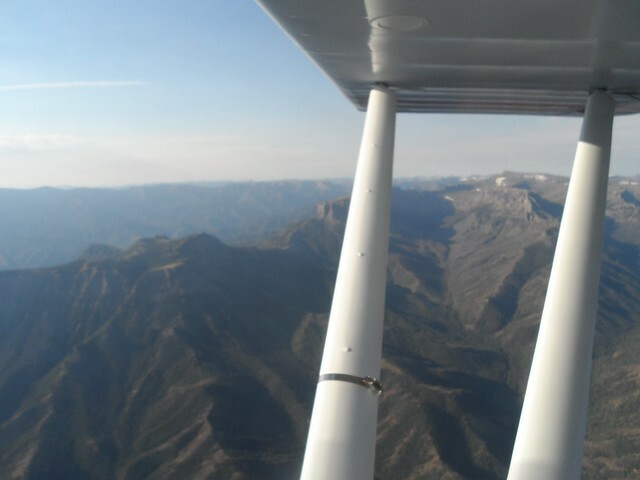 The Tri-Pacer impresses me, taking us to a respectable 12,000 feet! The view is gorgeous and the air is glassy smooth. You have to be there to really take it in. 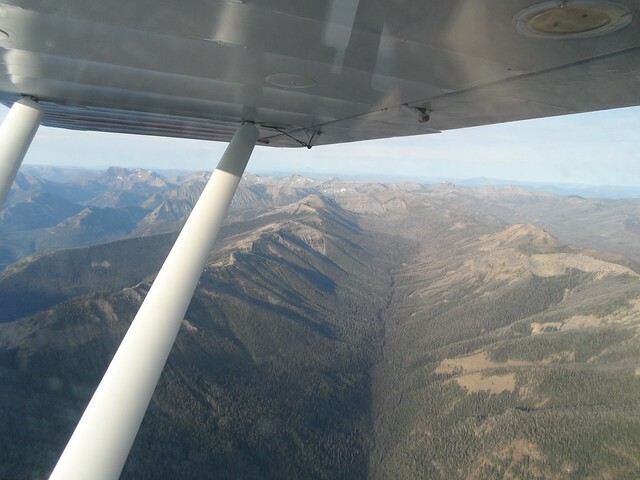 We have about 30 minutes of mountain flying ahead, following a road east through Sylvan Pass. 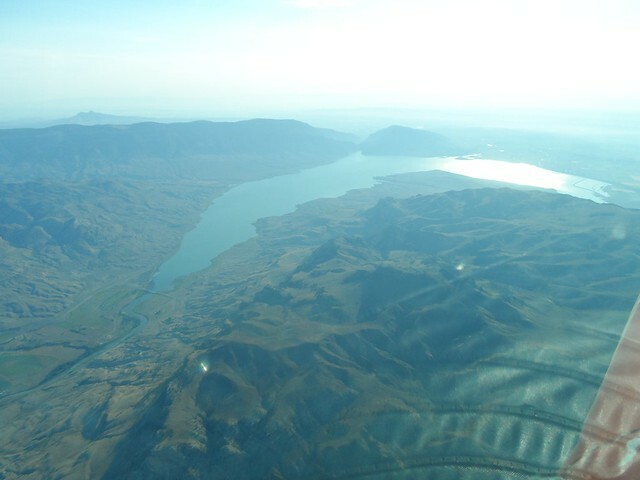 Finally we see Buffalo Bill Reservoir near Cody, WY, which signifies we are almost through the Rocky Mountains. 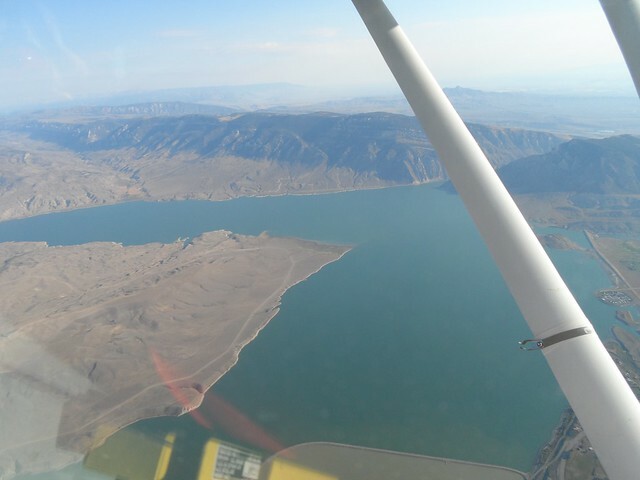 We fly over the lake and then turn to a southeast heading, keeping our altitude so we can make it though the Bighorn mountain range. 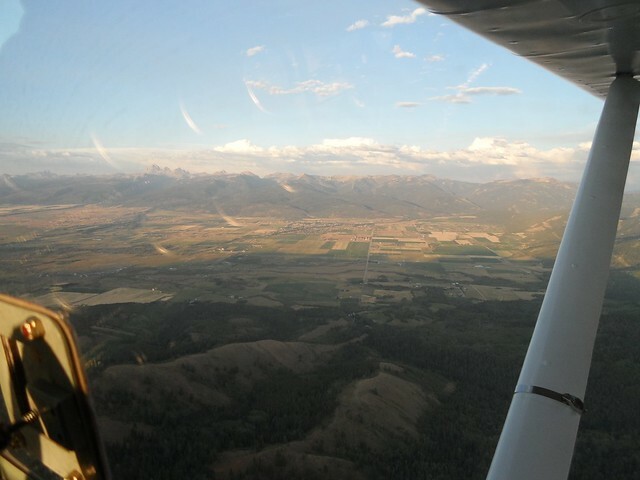 Landing at Buffalo, WY, we gas up the airplane and take a quick break before our final leg of the day. 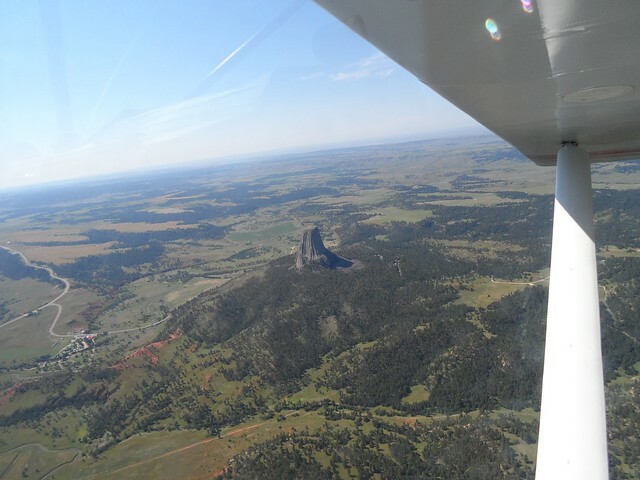 Our next destination is Custer, SD… but we take a slight detour to the north so we can get a view of Devil’s Tower in east Wyoming. It cost us 20 minutes, but when else are we going to be in the area? We reach the Badlands of South Dakota. It is a really nice area, very pretty and forested. 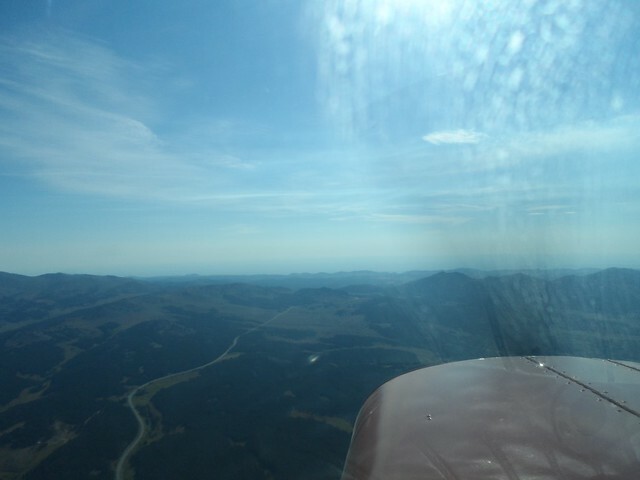 Finally we land at Custer’s airport and are done flying for the day. 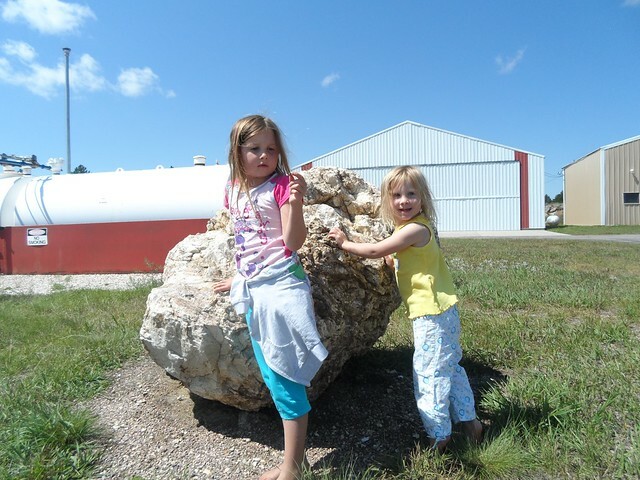 As we are fuelling and getting the plane tied down the girls are attracted to a cool rock by the gas pump. This entry was posted in Travel, Trips and Sight Seeing on August 21, 2013 by scott.